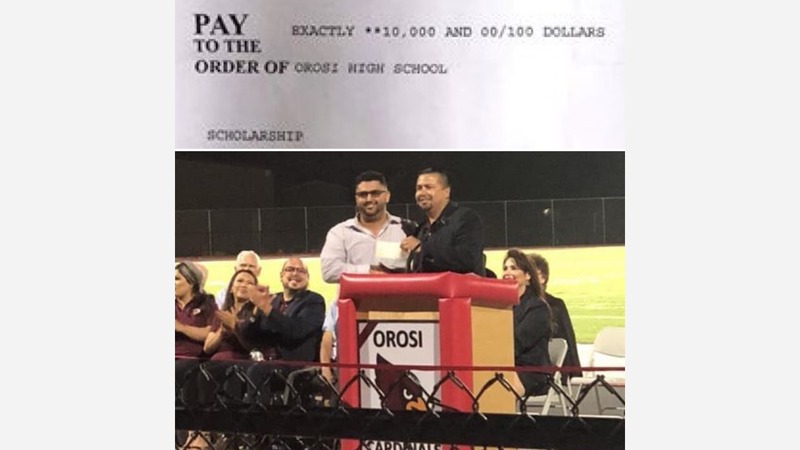 For the second time in the past year, Cutler business owner Jack Mohamed donated a whopping $10,000 to Orosi High School for student scholarships. He presented the check at last week's ribbon cutting ceremony for the school's new football stadium. Mohamed first wrote a check last December. The community support he received in return encouraged him to donate again. "I realized my community supported me more after my first donation," Mohamed said. "Kids wrote me letters for last year's donation and that touched my heart and made me feel good. Parents came in person to the store thanking me because their kids got the scholarship." School principal Beto Vaca says the scholarship money will be given to 20 deserving students, each getting $500. "I was extremely pleased to hear that he was donating another $10,000 dollars for student scholarships," Vaca said. "It's a great example of what business owners need to do - to give back to the community that supports their businesses." Jack owns a number of businesses near campus, including Cutler Food Mart and Jack's Gas & Deli.